'Scrooge in Love!' plays through Dec. 16 at the Lucky Penny Community Arts Center, 1758 Industrial Way, Napa. Thursday–Saturday, 7pm; Sunday, 2pm. $20–$40. 707.266.6305. luckypennynapa.com. 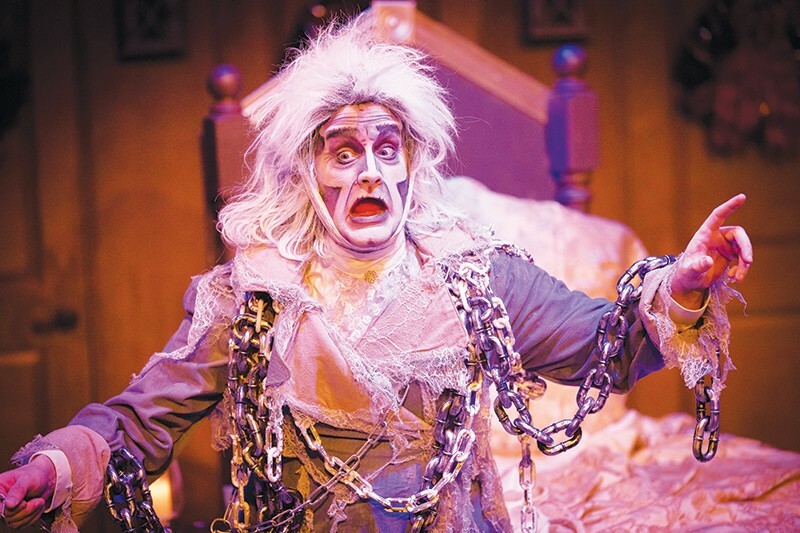 HEAVY METAL Brian Watson sports weighty chains as Marley's ghost. Movies and television have long been a haven for sequels and spin-offs. Live theater? Not so much. Which is why it's interesting that North Bay venues have programmed three such shows this holiday season. Napa's Lucky Penny Productions has the most traditional of the lot with its presentation of Scrooge in Love!, a terrifically entertaining musical continuation of Charles Dickens' classic Christmas Carol. Directed by Dyan McBride, the story begins exactly one year after Ebenezer Scrooge's Christmas Eve redemption. To his dismay, Scrooge (a perfectly cast Brian Herndon) finds himself once more in the company of ex-partner Jacob Marley (Brian Watson). It seems that Marley and his associated Christmas ghosts (Andrea Dennison-Laufer, Scottie Woodard, F. James Raasch) aren't satisfied with Scrooge finding the Christmas spirit—he has to find love. And so the tale of Scrooge and Belle (a charming and steadfast Jenny Veilleux) is told via trips back to the past and into the future with a very amusing stop in the present. We see Young Scrooge (Ryan Hook) blunder his way through a failed courtship and we see old Scrooge continue that blundering in the present. Be assured, however, that the show won't end without another Christmas miracle. The score, with music by Larry Grossman and lyrics by Kellen Blair, runs from the giddy and boisterously delivered ("I Love Love") to the contemplative and melancholy ("A Kitchen Built for Twenty (With a Table Set for One)") with a heaping helping of the festive delivered by the entire cast. Herndon gives a stellar performance as Scrooge, and his performance is complemented well by the supporting players. The ghosts, in particular, are great fun, with Watson an imposing but humorous Marley, Dennison-Laufer an operatic hoot as the Ghost of Christmas Past, and Woodard's Christmas Present looking and acting like he's popping by after a long night at a SoHo club. No Bah, humbugs from me, as Lucky Penny's Scrooge in Love! is the most "Christmas-y" show I've seen this year.